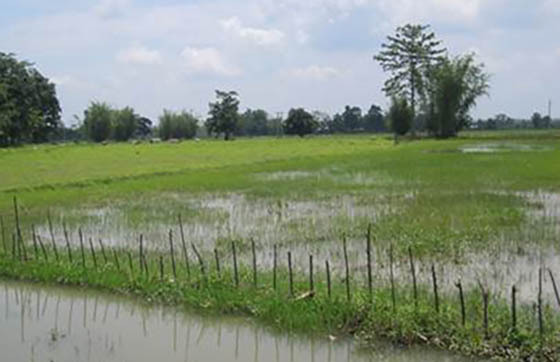 A scoping mission with a team from Aaranyak led by Suman Bisht and Sarah Nischalke from ICIMOD visited five villages in Tinsukia District, Assam, India in the eastern Brahmaputra River basin under the Himalayan Climate Change Adaptation Programme (HICAP). Most villages were adversely affected by floods in 2012 and suffered loss of livestock and agricultural productivity. Food security in these areas is at stake and people have had to increasingly rely on other income sources such as remittances or daily wages from construction sites, tea plantations, or coal mines. Farmers with agricultural holdings in raised areas are replacing food crops with tea cultivation as it provides a more stable income source and requires much less labour than vegetable cultivation. This could possibly lead to reduced food availability in the area. 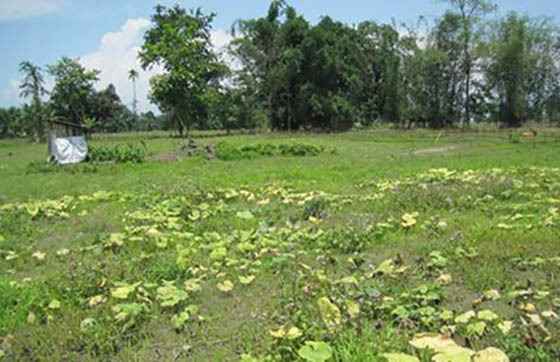 The mission also identified lower Laopani, a flood-affected area located in northwestern Tinsukia District, for an in-depth study as it hosts a mixed community with elaborate farming systems. The place-based study will be jointly conducted by the food security and gender components within HICAP. It will investigate changing farming systems in the context of climate change and other drivers of change and their impacts on food security from a gender perspective. This is one of many place-based studies planned in the different river basins being researched under HICAP. The overall aim of the study is to assess and show variations in the adaptive capacity of different farming systems to climate change and the bottlenecks in adaptation within the respective communities. The topics will be addressed through a gender-disaggregated research design. The intensive fieldwork will be conducted during the months of May and June 2013. An earlier study on circular migration and remittances under HICAP was conducted in the lower Laopani area. A larger and intensive Vulnerability and Adaptive Capacity Assessment (VACA) baseline survey covering about 2,000 households was also conducted in Tinsukia District and other districts in 2012. The results from all these research activities will contribute to policy discussions on issues and solutions to climatic and other changes affecting rural lives in Assam.